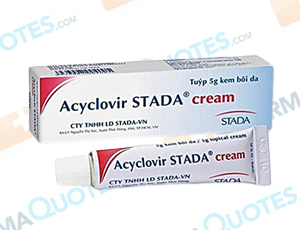 Acyclovir is an antiviral drug used to treat infectious outbreaks of cold sores, shingles, chickenpox, and genital herpes. This drug works by fighting the virus and decreasing the severity, length, and frequency of outbreaks. People who take Acyclovir experience faster healing and less pain and itching during outbreaks. This drug may also be used to prevent infections from spreading when a person has a compromised immune system. This and other drugs should be used only under the direction of a doctor who has a complete and current list of medications and medical history, including allergies. Patients who have an allergy to valacyclovir or any other drugs may have a reaction to an active or inactive ingredient in Acyclovir. Before using this medication, discuss conditions with your doctor including kidney problems, weakened immune system, and alcohol or marijuana use. This drug can cause dizziness and drowsiness that is amplified by substance use. Limit alcohol and do not drive while taking this drug unless you can do so safely. At start of treatment side effects may occur including nausea, diarrhea, headache, and vomiting. These should subside in 1-3 weeks. If they persist or worsen, notify your doctor. Allergic reactions to this drug are rare, but possible. If symptoms of allergic reaction occur (hives, swelling of lips/face/tongue, itching, severe dizziness, trouble breathing) discontinue use and seek emergency medical services. General Acyclovir Warning: The above information is for informational purposes only and is not meant to be a substitute for professional medical advice, diagnosis or treatment. Please seek professional medical advice before starting, changing or terminating any medical treatment. Pharmaquotes is not offering medical advice, pharmaceutical recommendations or endorsing any specific prescription drug, pharmacy or other information on the site. Pharmaquotes provides no warranty or guarantee for any of the discount data, medication, or other information.